It creates the reference audio test signals as Sine-wave, Frequency Sweep, White Noise and Pink Noise, and has a high precision of CD quality and a frequency accuracy of 0.1Hz. Frequency Sweep time can be altered as desired by the user. 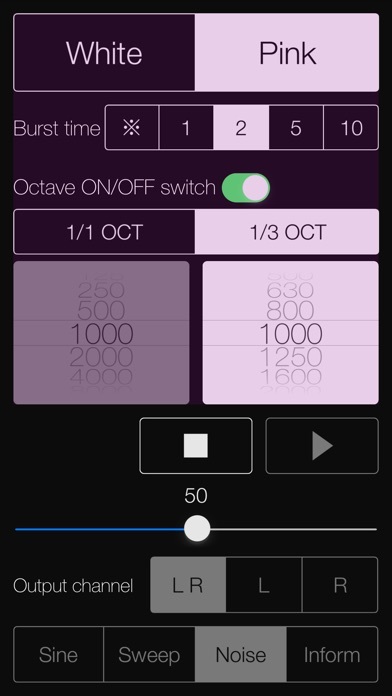 The audio signals created by this app can be best used in conjunction with external devices, such as an audio spectrum analyzer or a sound level meter. Supports of frequencies range between 20Hz to less than 21kHz. On the keyboard input of frequency, please press the Return key after entering a numeric value. Also, in the Sinewave Sweep mode, please press the Return key after entering continuously two numeric values. Please be careful that the high-frequency signals of high volume in continuous may damage the loudspeakers, even if your ears do not perceive it as being too loud. Please visit our iOS App Support page for more information on this app.